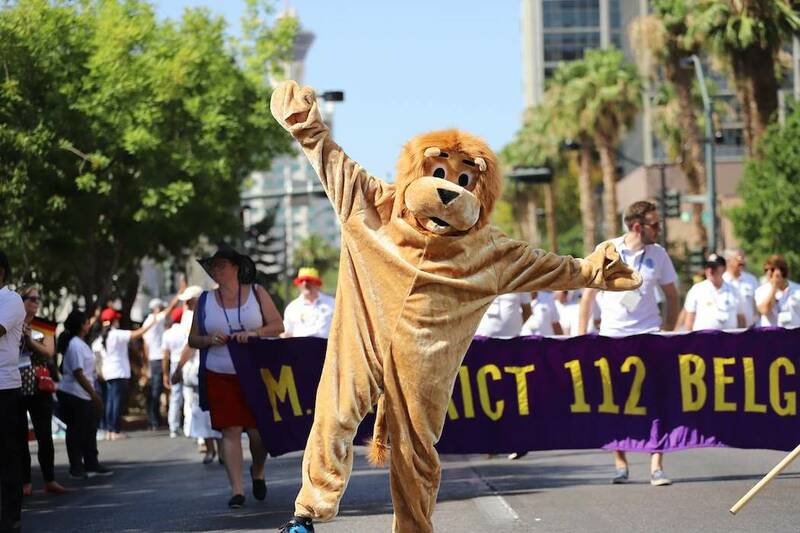 The Lions Club International inundated Las Vegas last weekend for its 101st Annual Convention, including its 51st Parade of Nations and Pahrump Valley Lions Club members were a big part of all of the activity. 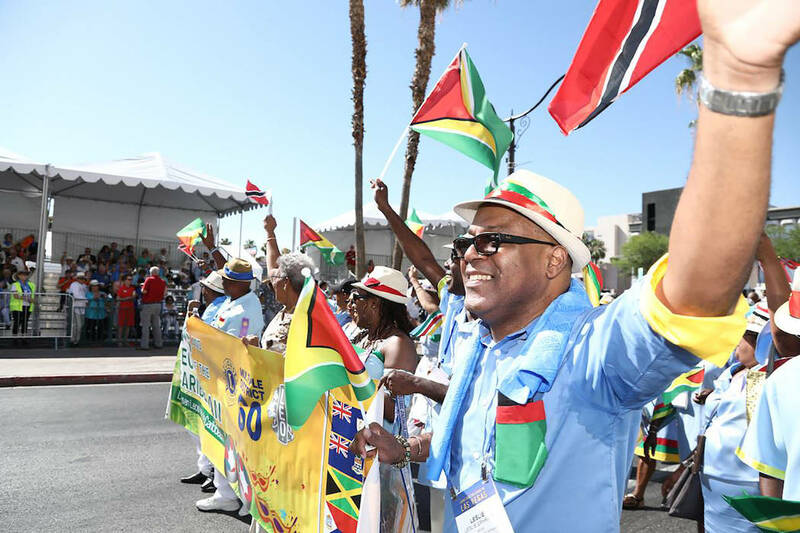 Special to the Pahrump Valley Times This photo, provided by the Lions Club International, shows just some of the thousands of Parade of Nations participants who took to the streets of Las Vegas on June 30. Special to the Pahrump Valley Times The Lions Club mascot is pictured cavorting for the crowds of spectators enjoying the 51st Parade of Nations. Special to the Pahrump Valley Times Nations from all across the planet came together in a showing of unity during the Lions International Parade of Nations, demonstrating their belief in the need for harmony among all peoples. Pahrump resident and Lion’s Club member Bill Newyear was the head of the parade, a large-scale event symbolizing and encouraging unity and harmony. The parade was comprised of approximately 15,000 participants from 125 different countries, many of whom came garbed in the clothing of their native lands, creating a fabulous display of diversity all enveloped in the concept of togetherness. Newyear detailed that there were delegations from all over the globe at both the convention and the Parade of Nations. Newyear was far from the only person enthusiastic about the turnout and success of the event. Lions members from all represented clubs were obviously thrilled to take part and help spread the word about the world’s largest volunteer organization. 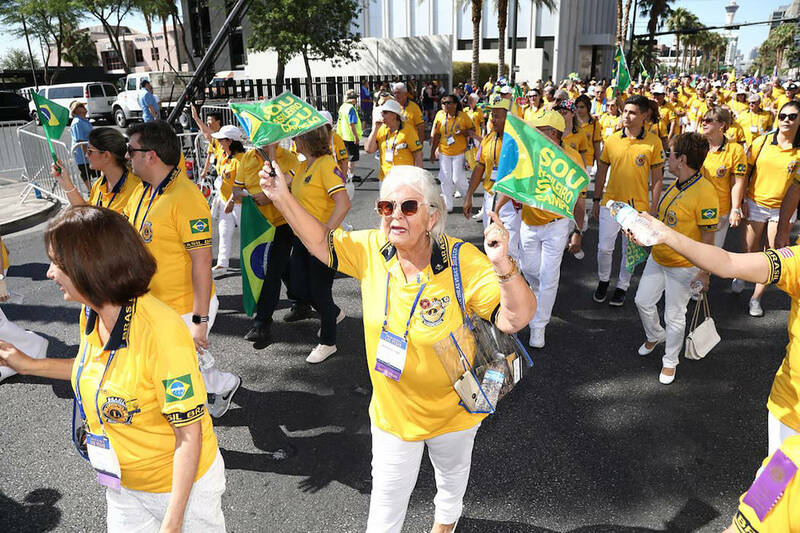 “The Lions International Parade of Nations was and always is an incredible success” Lions International Media Contact Michelle Weber declared following the huge event. “It is the one time every year when our members gather to celebrate the past year’s victories and to talk about how we can serve our communities back home in the year to come,” she said. “You can imagine a parade like this draws a lot of attention. Weber said there were more than 20,000 members in Las Vegas to celebrate, share their experiences and knowledge and learn from other charitably-minded Lions. This year, there was a large focus placed on one specific topic, that of a disease which affects millions of people worldwide. Weber said the Lions International Parade of Nations is a show of the strength and pride of the many communities involved, with the most important factor being unity. “As the world’s largest volunteer organization with 1.5 million members in 200 countries, we do great work,” Weber stated. In Pahrump, the local Lions Club is always looking to add to its volunteer ranks and those who might be interested are highly encouraged to get involved. Newyear said his membership in the organization has been an amazing experience and one that he thinks many other people would benefit from as well. “Melvin Jones, the founder of the Lions, is quoted as saying something to the effect of, you can’t really get ahead in life until you stop to help others. We are all on this planet together and it behooves those people who can to help those people who can’t,” Newyear said. The Pahrump Valley Lions Club meets the first and third Tuesday of each month. The next meeting will take place Tuesday, July 17 at 6:30 p.m. at the Pour House, formerly known as Draft Picks. For more information call 775-727-9016.